The 2.440 seal fits a 2.25 spindle only. 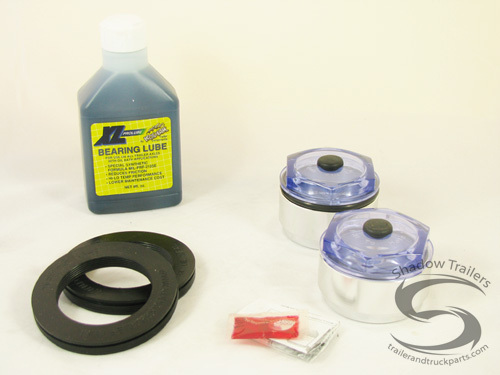 The XL Pro Lube Kit converts standard grease hubs to an oil bath bearing lube system. It comes with a specially formulated synthetic lubricant to reduce friction and help trailers run cooler for longer bearing life. The XL Pro Lube can also improve fuel mileage under normal driving conditions. The innovative design eliminates corrosion and leaks that lead to bearing failure. The XL Pro Lube features a unitized oil seal to eliminate leaks. This proven system has been used in the trucking industry for over 25 years. Bearings are oiled through centrifugal force and it is compatible with existing grease. The XL Pro Lube is made of anodized aluminum with a blue polycarbonate cap that makes it easy to visually check the oil. It is easy to install, provides lower maintenance, and is guaranteed not to leak oil. Like the oil bath hubs so much easyer to keep an eye on the hubs. Didn't like the grease gun method always seemed to put to much in and push grease past the seals onto the brakes. The seals were a little hard to install but a little time took care of that.